Two Pashto language poets are household names among the Pashtuns whether they live in Afghanistan, Pakistan or anywhere else in the world. One is the warrior-poet Khushal Khan Khattak and the other Rahman Baba. The former may sometimes arouse tribal animosity on account of his feuds with rival tribes but the latter is loved by every Pashtun. People visit an art exhibition for a variety of reasons: to look at art, buy it, meet other artists and art lovers, to write about the show or to merely be seen by others or to get photographed for the opening pages of some glossy magazine. The last motive drives many socialites out of their lavish lounges into a gallery where works of art are on display and a press photographer is ready to document their presence. The performance of Hamid Ali Khan at the Alhamra last week was a typical Pakistani concert. Billed as a ghazal evening, it could not remain restricted to ghazal because of the varied requests from the audience. Working on Muslim devotional arts of South Asia for the last six years and having studied the Shiite Muharram rituals in Pakistan and India, I decided to spend the first ten days of Muharram in Iran to observe the rituals of Shiite Islam that have so deeply influenced the social, cultural and religious life in Iran. It was, therefore, natural for the Pashtun to be outraged when they came to know about the recent bombing of the shrine of their most beloved poet. It was something unimaginable. The attack was seen as an attempt to destroy the Pashtun heritage. As someone commented, the enemies of the Pashtuns weren't even willing to spare their long dead heroes. The 16th century sufi poet's original name was Abdur Rahman. But he is held in so much reverence that he is universally known as Rahman Baba. The Pashtuns, and many other ethnic groups, reserve the title Baba for their religious, spiritual and literary figures. Babas are supposed to be old and wise men who preach peace and work for love, harmony and tolerance. Rahman Baba's shrine is located in a cemetery not far from Bahadur Killay, the suburban Peshawar village where he was born in 1653. He died in 1711 and is buried in Hazarkhwani village, sited three kilometres from the city near the chaotic Ring Road. Before Peshawar's haphazard expansion on all sides, his grave and the graveyard were located in the midst of a vast and green rural landscape. His mausoleum, with its gleaming white dome that is visible from afar, is still a bit removed from the main roads and not easy to approach. Poets and writers, along with his innumerable devotees, often complain that the shrine's location is lonely and off the beaten track. They want a wide approach road to be built to enable his fans to visit his grave more often. The mausoleum, which had become a landmark owing to its impressive height and façade, suffered extensive damage in the bombing. Engineers have declared the building dangerous and recommended its reconstruction. The ANP-PPP coalition government in the NWFP, which has come under strong criticism for its failure to provide security to the people, has already allocated Rs15 million for the reconstruction. Increased security measures have been announced for the shrine and a police post would be set up for the purpose. The security was lax at the time of the attack but nobody has been held responsible or punished for the lapse. One reason for the inadequate security was obviously the thought that nobody would attack and desecrate the grave and mausoleum of the most beloved Pashto poet. The ease with which the four or five attackers sneaked into the mausoleum from a rear door after smashing the windowpanes explains the laxity of the security at the place. Dawn hadn't broken yet and the few caretakers were apparently asleep or not even at the site of the mausoleum. They could have been at the nearby mosque or at their homes. The miscreants had enough time planting explosives to the four pillars that support the huge building. Two bombs were also buried on the right and left side of the grave of Rahman Baba, a man of God who never harmed anyone in his life. The bomb placed to the right of the grave didn't explode or it would have cause extensive damage. The five explosive devices placed in the pillars and the bomb planted to the left of the grave exploded simultaneously around 5.07 am and the explosions were heard all over Peshawar. Cracks appeared in the gigantic structure and the damaged pillars seem unable to support the building. It may collapse anytime but this hasn't deterred Rahman Baba's devotees, along with those hungry for a photo-session and publicity, from going inside to place wreaths, chaddars and candles, on his grave. Thousands of people have visited the shrine since its bombing. Many were seen weeping and wiping off their tears. Every visitor cursed the attackers. Most refused to believe that a Pashtun could do this to the mausoleum of Rahman Baba. Militants were the usual prime suspects but their motives appeared unclear. When the shrine of Bahadur Baba, a respected religious and spiritual figure, was attacked with missiles a day after the bombing of Rahman Baba's mausoleum, it was felt that this was a calculated move to desecrate the graves of saints and poets loved by the Pashtuns and was, therefore, an attempt to provoke them. Other shrines too have been desecrated in recent years. Pirs, faith healers and magicians have also been attacked and harmed in parts of the NWFP. A few were killed and others forced to give up the profession. Many faith-healers, who dealt in "taveez" (amulets) offering cure and good luck to clients, in Swat and rest of Malakand division were warned by the militants to stop their business or face the consequences. All of them complied after making public announcements and placing paid advertisements in the local newspapers. Villagers from Hazarkhwani, Bahadur Killay and other nearby villages held a demonstration to protest the attack on Rahman Baba's mausoleum. His fame had made his native village and the neighbourhood famous and proud. The bombing provoked every dweller of these ancient villages angry and triggered the spontaneous demonstration. The caretaker of Rahman Baba's mausoleum, Gohar Ali, received a threatening phone call from an unknown person two days before the attack. The caller threatened an attack if female visitors weren't stopped from entering the shrine. According to Gohar Ali, the shrine was partitioned for male and female visitors in a way that they couldn't see each other. He argued that it was impossible to stop the women from visiting the shrine as most came to the cemetery to pray at the graves of their relatives buried there. No extra security measures were put in place after the threats. The attackers, who according to most accounts were militants, thus found it easy to act upon their threats and bomb the mausoleum. The work on the Rahman Baba mausoleum complex was completed in 1994. It included the mausoleum, mosque, a little used library and a cafeteria. The project cost Rs 110 million but there wasn't any proper funding for the upkeep of the mausoleum. Mir Afzal Khan, the late chief minister of NWFP, had approved the project at the time and laid its foundation stone. Former President Farooq Leghari inaugurated the complex. According to Hidayatullah Khan, Nazim of the Hazarkhwani union council where the mausoleum is located and an active member of the Rahman Baba Adabi Jirga, residents of the area were bearing expenses of the maintenance and expansion of the shrine and serving voluntarily as its "khadims" (servants). The jirga held literary sittings at the mausoleum, which came alive on Thursday evenings as devotees and poets, writers and fans of Rahman Baba visited the place. The annual gatherings at the shrine were big events. However, the shrine remained deserted most of the year. It was one such night when the attackers found it easy to bomb the mausoleum and hurt the feelings of the Pashtuns. The phenomenon has become routine to the extent that one anticipates the presence of beautiful women who often appear more attractive than the work of art hung behind them. Being at an art exhibition is more like attending a social gathering, a party where works of art serve as props to invite and entertain distinguished guests. The inauguration of Saba Khan's first solo exhibition (March 5-13) at the Drawing Room Art Gallery in Lahore, too, was attended by celebrities of all kinds and status, who were mingling with each other, exchanging compliments and engaging in small talk. Very seldom, a few of them glanced at her works to admire her strong colours and bold compositions, but weren't really bothered beyond that. They weren't particularly interested in the subject matter which ironically was all about the crowd that was present to appreciate the paintings. If the notion of art being a mirror of society is true, it was too obvious in the exhibition. What Saba Khan has painted are the portraits of society ladies and successful men often found in the social pages of newspapers' Sunday editions and fashion magazines (perhaps the same people who were looking at her canvases that afternoon). Her paintings functioned as a mirror in an uncanny manner. Actually a work of art can be a mirror to its surroundings in several ways. It may reproduce the environment in a realistic way, reflect the situations at a specific space or render the idea of its time, fully and faithfully. So with each artist and in every period, the notion of art being the mirror is implemented in a different manner. Hence, the mirror-like characteristic seen in the work of Khan has a familiar but unpredictable association. A graduate of NCA (2005) and currently pursuing her MFA at the Boston University, Khan has portrayed what she experienced or imagined in her surroundings. On the surface, figures in expensive clothes, heavy makeup and expressive postures remind of glitterati, but they also indicate something deeper, crude and cruel. Her paintings in multiple mediums suggest the artist's peculiar way of looking at the world. That world consists of people, places and patterns (from a range of sources, including miniature paintings to Japanese prints) that have fascinated the painter and simultaneously invoke a range of meanings for the viewer. Bloated men, overtly made-up women, society damsels, cats, dogs and crows have surrounded her canvases. These entities are rendered in exuberant hues, with elaborate motifs, filling the space sometimes inside or/and against the main model. The heavy application of paint, rather a sensuous scheme of spreading thick coats on already coloured surfaces, and uncommon palette add another layer to her content, constructed with unusual depiction of human beings, animals, landscapes and cityscapes. In its essence, the work of Khan captures many aspects -- including social, cultural and ironic -- of life. Glamorous girls posing for a picture in a fashion magazine, a man holding/enjoying a doll like creature in his lap, women inside exquisite interiors are efforts to weave a narrative that unravels tension and complexity in social and familial relationships. Not only that, Saba hints at bonds of other types by imbibing bodies within intricate designs executed in various tones. Perhaps, like Aisha Khalid, this is an effort to comment on the inhibitions, norms and regulations that exist in our culture. Yet paradoxically, these constraints and confinements -- of overwhelming designs -- appear beautiful, attractive and alluring, like in reality. However, it is only animals, birds, children and mentally deranged personages in her work that seem liberated from these bonds. With the power of life constructed with the help of strong colours, odd gestures and exaggerated shapes, these are not contained in a structure or boundary. On the other hand, their presence is pronounced, rather primitive. In this sense, the work of Khan could be read as a critique on the decadence of culture (from an insider's point of view), although the painter -- obviously -- hesitates to proclaim it as the main or one of the messages of her art. This preference for raw nature in place of 'elitist culture' was visible in the way Khan renders the crows perched on the ground, dogs composed within frames or against the dark shades of different colours, and trees and fields drawn in an expressive manner. But it is the choice of colour that marks her real content. Her approach to colour is instinctive, so the combination of contrasting hues turns her canvases into tactile surfaces. Her ability to blend vivid tones into a unity make her work different and distinct. Along with her painterly approach, Saba has consciously established links with the visual tradition of this region; thus connections could be traced between the tradition of miniature and her contemporary paintings. Similarly the influences of popular urban art – decorations found in shop arrangements, cheap greeting cards and other items – was seen in her work. This is an aesthetic preference that could be well matched with the Baroque sensibility. So, in one body of work, Saba has managed to combine two distinct movement and trends of our art: modern miniature as well as the popular transport/urban art. This infusion, rarely seen in our artistic surroundings, was the reason for her work being strange, special and splendid. In this age where eclecticism is celebrated, it is difficult to artistically place eclecticism in vocal music. A Pakistani concert is supposed to progress in accordance with the choices of the audience; the preferences of the performer are usually placed on the backburner. A vocalist may have made his choice or a number that he has prepared and wants his audience to share in its artistic merit but it is rare that he will be given an open choice to sing according to his own taste. It is well-known that the audiences have demanded of the singer rendition of the famous verses of poets and even popular numbers of other contemporary artists. One has also seen Mehdi Hasan being forced to sing his film numbers when actually he wanted to sing one of the newly composed ghazals. This may be a throwback to the tradition, which for want of a better word can be termed as "chamber music." In our history the musicians and the vocalists were almost considered private properties of the patron. They performed according to his wishes. The nature of the musical performance had been such that there was a very close relationship between the performer and the audience -- it was live and it was instant. In most cases, the patron happened to be the only audience and the one-to-one relationship became the most overbearing factor in this equation. Hamid Ali Khan has been an example of this eclectic musical taste of the urban audiences of the country. He is a known classical vocalist but he also switches to the ghazal and then he is made to sing thumri, a geet and if need be a kaafi. All these forms are requested to be sung which the audiences want to listen to, without paying any heed to the specialty the occasion might hold or the performer might prefer. He usually begins with a shortened classical number, shortened to only the bandish, the aasthai and the antara and then fast tracks to the drut and the taans which increase in their tempo at a very accelerated pace. All this does not take more than ten minutes where the audiences first applaud because the bandish is familiar, and then comes the virtuosity of the vocalist in taans. After this formality is over, the audience too settles down to the regular, more popular numbers which often are ghazal, geet, kaafi numbers or even something else like a film song or a patriotic tarana. Hamid Ali Khan is obviously a victim to the circumstances that he has lived through. The youngest of the sons of Ustad Akhter Hussain Khan, he grew up in an era when classical music had few takers. 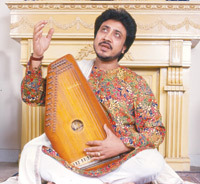 His elder brothers Ustads Amanat Ali Khan and Fateh Ali Khan were trained in the rigours of classical music because, in the years before partition, the older system of patronage was intact and required the performance of a genre according to the major tradition prevalent -- the kheyal followed by a thumri or dadra and that too at the end. But when Hamid Ali Khan grew up, he saw the tradition disappearing with his elder brothers, too, switching to more acceptable and popular forms. Amanat Ali Khan had to sing ghazals, film songs and geet ang thumris to survive because he had a dwindling audience for his classical music. Being more adaptable and helped by his highly trained voice, he was able to switch over or combined the two. His versatility became a virtue but in the case of many others including his brother Fateh Ali Khan versatility was labelled as compromise, as stooping to or pandering to popular taste. It was not so long ago that the kheyal singers never sang the ghazal despite its greater acceptability among the masses. They thought it was beneath them and if some did they were assailed, derided and even lampooned for having dishonoured the ancestors name and mired the family tradition. As the years went by, the audience too became unfamiliar with the hierarchy of the forms. There was lesser number of people knowledgeable or careful about etiquettes of listening who would request the vocalist or the musicians to perform according to his/her stature and preferences and not insist on their own choices. But gradually it has disappeared and now audience are not even aware that it is rude to request a singer to sing what he thinks is beneath him. The standard gauge is the popularity rating. It is the best seller list that determines the legitimacy of a musical number. At the Department of Fine Arts, University of Tehran, Forugh Khoshnevis chalked out a plan for me in different places and cities for specific Muharram rituals. On the second of Muharram, she took me to the Centre of Photography at Vali Asr Street where a collection of best photographs related to Muharram rituals in Iran were displayed. This gave me a good overview of my subject. Next day, I visited the Qehwa Khwani (tea shop) painting at Talaar-e-Wahdat, an art gallery in Tehran. Qehwa Khwani Painting is a traditional art form existing for more than fifty years. 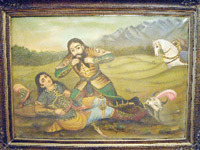 Originally different stories related to the tragedy of Karbala had been painted in western style by the painters and were taken to Qehwa Khaneh for open critique. Later on, these paintings were given the name of Qehwa Khwani paintings. Unfortunately this tradition does not exist any more. After getting out of the gallery, we went to see Beharooz Mahmoodi Bakhtiari, Assistant Professor of Linguistics and Head of Library at University of Tehran, who gave me a set of research papers read in a conference held in Tehran last year. This conference was arranged particularly on the traditional theatrical performance of Taziyeh in which the story of Karbala is dramatised. On his suggestion, I proceeded to Danishjoo Square for taziyeh. There are certain places or theatres where the Taziyeh is performed called takiyeh. The first Takiyeh Dowalat was built in Tehran by Naser al-Din Shah in 1876. This building was designed in cylindrical form which accommodated a large number of rooms, chambers and halls; however, the shape of central stage varies from round to rectangle. But at Danishjoo Square, some volunteers have constructed a temporary theatre of tents in the courtyard of Kargardan, a city theatre in Tehran. 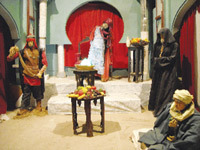 The play was preceded by a custom of Tasht Guzari; symbolic rituals in which a mashk (a water bag of leather) of Hazart Abbas, already filled with water, is evacuated into a tasht (a basin) and after the illumination of candles, the water is distributed to the participants. The tasht symbolizes the Euphrates whereas the overall custom denotes the historic arrival of Imam Hussain at Karbala. This tradition is also taken as a formal announcement of the month of Muharram in Ardabil near Azerbaijan. At the end of the ritual, all the participants got inside the theatre and performance started. Normally the stage is covered with sand but it was painted in grey and minimal décor as the setting is meant to evoke the desolate, bleak desert of Karbala. The few props were symbolic: for example, a tasht (representing the Euphrates); an empty mashk (related to Hazarat Abbas) and a branch of tree indicating a grove of palms. The heroes or members of the family of Hussain were dressed prominently in green symbolising paradise, and the villains wore red denoting bloodshed, cruelty and oppression. Nobility depicting characters were singing their part while the bad characters simply recited their lines. Male actors played the roles of women, dressed in baggy black garments covering them from head to toe and their faces veiled. Draping of white sheet of cloth over protagonist's shoulders represented a burial shroud indicating that he is prepared to give up his life. During the play, I realised why the western theatre directors are interested in learning the techniques of dynamic and constant interaction between the actors and the spectators. The use of circular path outside the stage by the characters was most interesting which is not possible in the traditional box theatre. There was also an ingenious use of auxiliary stage extended into the audience which was being used by the actors jumping off the stage and circumnavigating it. The action spreads from the main stage to the ancillary stage giving the action the centrifugal and centripetal movement from the centre to the periphery. We should not forget, however, that the main thrust of taziyeh is to identify with the suffering of Imam Hussain and his family to the spectators who are already strong believers of Imam and take the act of watching taziyeh as religious duty. I also watched the same play of taziyeh titled "Dar Ghabe Mah" (In the Picture of Moon") at Talaar-e-Wahdat in box theatre the next day. It was in fact a transformation of traditional taziyeh into box theatre in which director Hussain Musafir Aastaneh effectively used multi-media projectors and shadow technique as a supporting element to enhance the interplay of light and movement. He also told that the same play was performed in a similar manner in Paris under the auspices of UNESCO three years ago. This time, though, he exaggerated the story to make a statement -- by linking up the tragedy of Karbala with recent Israeli attacks on Gaza as tyranny, oppression and terrorism. In Mashhad, I visited an installation subjected "Az Kufa taa Karbala" (From Kufa to Karbala) at Khayaban-e-Imam Reza. Under the supervision of Muhammad Hussain Dehstani, about a hundred artists constructed it in four months, incurring a huge cost which was borne by the artists themselves. This installation was constructed to portray the real situations and to recall the story from Kufa to Karbala step-by-step. This exhibition was divided into seventeen different parts from Kakh-e-Muawia (palace of Muawia) to the shrine of Imam Hussain. All the negative characters were depicted in real form unlike Imam Hussain and his step-brother Hazrat Abbas who were symbolised by flower and hand respectively. The installation was an imaginative influence from the traditional taziyeh that took the viewer back into the incident at Karbala. Finally, I went to Yazd for taswa and ashura (ninth and tenth day of Muharram) because Kashan, Yazd and Khozestan are known for the Nakhl. The word 'Nakhl' is of Arabic origin, stands for 'palm' and is also a symbolic form of cypress tree (which is evergreen like Imam Hussain). It is carried in the processions of Muharram on the days of taswa and ashura in different cities of Iran, as in Pakistan we have three dimensional Tazias (a model of Imam Hussain's shrine) that are carried in the processions of ashura. No wonder Iranians are recognised for their art forms. They have transformed their social and cultural life into religious life to this day. An interesting subject for anthropologists and social scientists about an environment where Shiite Islam is the state religion.